This Research in Focus is written by science writer Peter Minorsky (ASPB and Mercy College) who writes the monthly On the Inside column for Plant Physiology. This summary describes a paper available online now for publication in the February 2016 issue. Grain abortion enables a few viable seeds to complete development under drought conditions, but also causes major losses in yield. The phenological stage exhibiting the maximum sensitivity to water deficit is the anthesis-silking interval, the time elapsing from male flowering to the emergence of styles (silks). 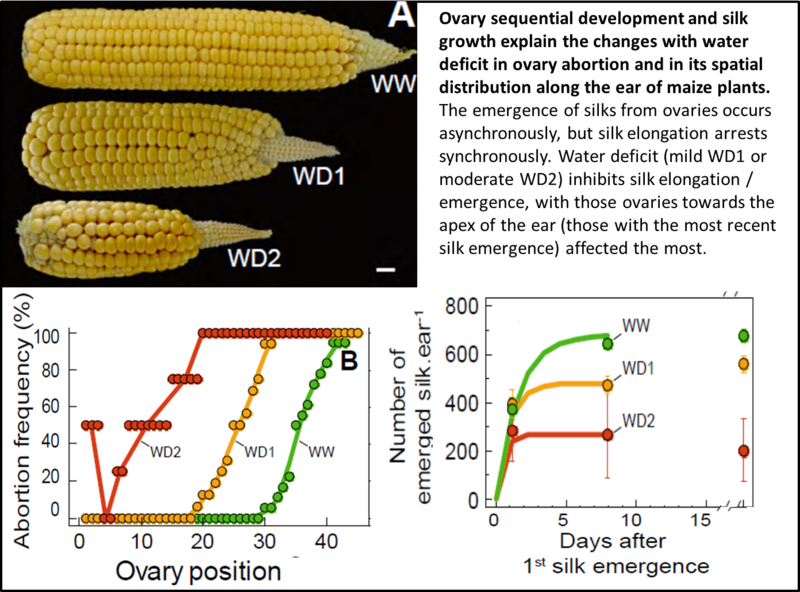 An irreversible switch in ear development is observed when water deficit is imposed at this time, resulting in ovary/grain abortion, even when viable pollen is provided to silks. The causal link between the timing of silk emergence and ovary abortion is not clearly understood. Using maize (Zea mays), Oury et al. have tested the hypothesis that abortion is linked to the differential development of ovary cohorts along the ear and to the timing of silk emergence. The authors followed ovary volume and silk elongation in four hybrids under four levels of water deficit for almost a month. In all treatments, the authors measured the growths of ovaries and silks as a function of time and position on the ear. A novel position-time model allowed them to interpolate temporal patterns of growth from the spatial position of ovaries along the ear. This model is equivalent to those based on plastochron index for leaf development in which organs of different generations are analyzed as having common growth rates with delayed development stages according to their spatial position. In this way, they could analyze the links between the abortion frequency of apical ovaries, temporal patterns of ovary and silk growth and base-to-apex gradient of development. Abortion rate in different treatments and positions on the ear was not associated with ovary growth rate. Under conditions of water deficit, however, silk growth rate decreased and stopped simultaneously for all ovary cohorts 2 to 3 days after first silk emergence as compared to 7 to 8 days in well-watered plants. Abortion occurred in the youngest ovaries whose silks did not emerge 2 days before silk arrest. This mechanism accounted for more than 90% of drought-related abortion in their experiments. It resembles the control of abortion in a large range of species and inflorescence architectures. These findings may have important consequences for breeding drought tolerant maize, and for modeling grain yields under conditions of water deficit. Oury, V., Tardieu, F. and Turc, O. (2015). Ovary apical abortion under water deficit is caused by changes in sequential development of ovaries and in silk growth rate in maize. Plant Physiology, (In press). This paper includes two Supplemental Movies showing silk emergence in well-watered or water-deficit conditions that effectively demonstrate the impact of water deficit on silk elongation.